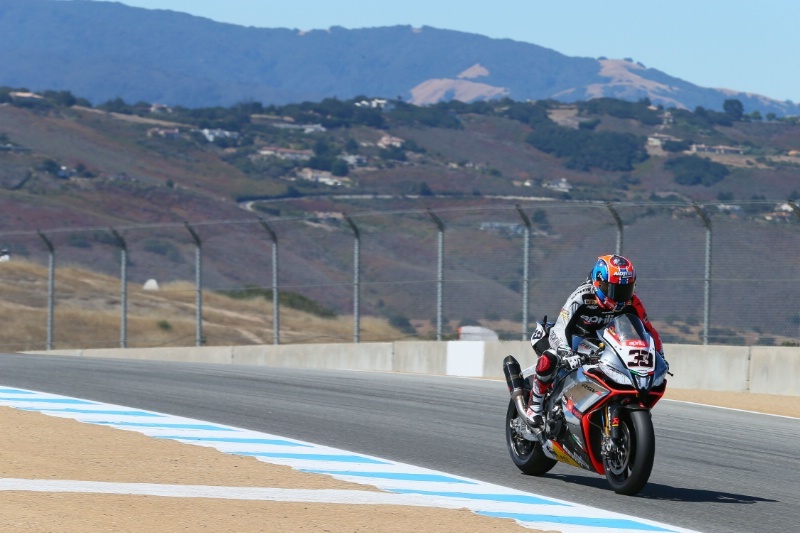 The World Superbike circus was welcomed at Laguna Seca with the traditional blazing Californian sunshine beating down. It would put weather anomalies to one side for the weekend, the riders able to focus on flat out racing on a dry circuit. Tom Sykes got off to a flyer in the first race, flanked closely by both Aprilias. Leading into the corkscrew for the first time, Sykes went in too hot and both Aprilia riders needed no second chance to make an early move, putting Sykes back to third. Meanwhile back in fourth, Welshman Chaz Davies took a heavy tumble on his Panigale at turn seven, eventually getting to his feet. It was a disappointing end to Davies’ race at a circuit he knows well. Back at the front the Aprilias made a break for it with Melandri leading and Guintoli applying pressure through the last half of each lap, unable to make a pass. It ended that way with Melandri bringing his RSV4 across the line with an impressive wheelie, his team mate a second behind. 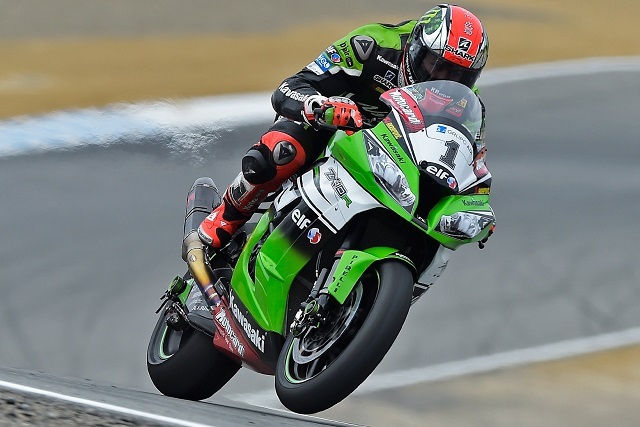 Tom Sykes was a further five seconds back again, complaining of a lack of edge grip from his ZX-10R. Race two saw two riders missing from the grid. Home rider Aaron Yates would be unable to start as well as Chaz Davies who took a knock to the head during his crash in race one. Tom Sykes got off to another rocketship of a start, heading into the first turn in the lead. The Aprilias were once again hot on his heels and Guintoli made a pass on Sykes on lap five. He couldn’t make it stick though and Sykes came back through into the lead at the corkscrew, forcing Guintoli’s Aprilia wide. Marco Melandri took swift advantage and slotted in for second place. On the eleventh lap the red flags were brought out after Suzuki rider Alex Lowes made a mistake at the corkscrew, falling hard and injuring his already damaged leg in the process. Once Lowes was taken away by ambulance the grid reformed for a restart. The restart saw Melandri fly into the lead ahead of Sykes and Guintoli. Sykes immediately tried to get past but couldn’t make any convincing moves on the Italian. All too quickly the red flags were out again, this time to remove the injured Sylvain Barrier from the circuit after a heavy crash at the final corner saw him reach the concrete wall. Another restart, another brilliant start from Melandri, into the lead once again. He stayed there for two laps before turn eleven took another victim, this time it was the race leader Marco Melandri. With Sykes now into the lead he put the hammer down to shake off the remaining Aprilia of Sylvain Guintoli. He didn’t clear much of a gap but it was enough for Sykes to bring his Kawasaki home for maximum points in first position, Guintoli following behind.